I had visited Wellington often before and driven around its waterfront. I knew it was an attractive city. But I didn’t fully appreciate that the ocean and spectacular and rugged southern coast was so accessible and integral to the town. Wherever you are in Wellington, the sea is nearby; be that the harbour, bays or open ocean. From our house, high up on the hill in the neighbourhood of Brooklyn, it is a short steep descent to the compact central city, where the Te Papa museum sits at the typically developed urban harbourfront. A few minutes away is Oriental Bay, situated in a sandy and sunny spot, wealthy apartment blocks stacking the steep hillside. 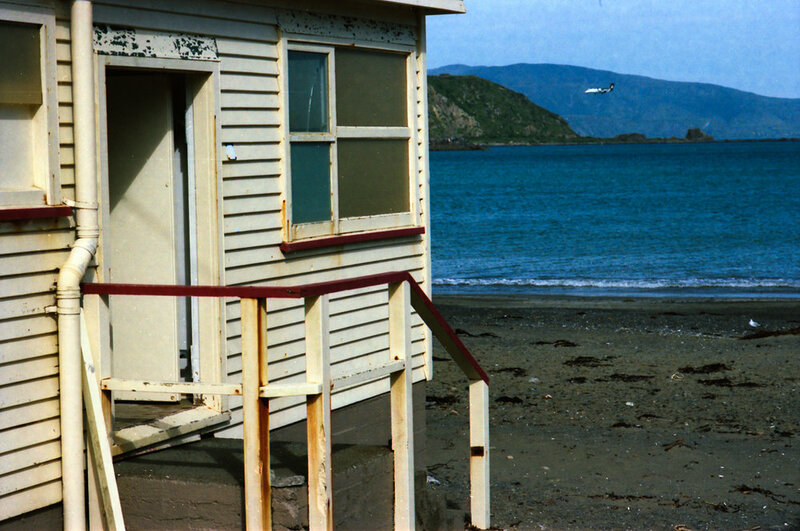 Following the road, which twists a few kilometres past Evans Bay, the airport and out to the Miramar peninsula, you end up at the Wellington harbour mouth. Along the way, you pass through compact and rustic nautical villages. At the harbour mouth, the road turns east and along the wild south coast. Cruising through Island Bay, on a clear day, you can see the snowy peaks of the South Island. The last stop on the loop, before heading back inland and a few kilometres home to Brooklyn, is Ohiro Bay. This is our closest and most visited beach. Like a small fishing village, rocky and rough, with a few decaying batches at its perimeter, it is where Jefrey our dog gets his regular walk. Sometimes we see dolphins or seals. Usually, when I am out with Jefrey I like to take the camera, and below are a few photographs taken on 35mm film - mostly on my Nikon FE2 or Canon EOS-1 and various lenses. Usually I use Ektar 100 film. On New Year's day 2018, I also took a motorbike ride on my Royal Enfield classic around the loop described above. Below is a short video documenting that ride.